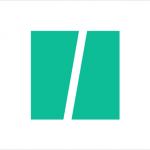 On Wednesday, masked gunman killed 12 people in an attack on the Paris office of the satirical magazine Charlie Hebdo. Those killed included the magazine’s editor, several other well-known cartoonists, and two police officers. Although there is no verified claim of responsibility or motive for the ambush, the targeted newspaper is known for publishing controversial political and religious cartoons, most notably of the Muslim Prophet Muhammad. In a video, the gunman, are seen shouting “Allah Akbar,” meaning “Allah is [the] greatest” in Arabic. Immediately following the attacks, a number of prominent Muslim leaders denounced the violence as not reflecting or representing the values of Islam. Other Muslims took to social media to condemn the attacks using the hashtag #NotInMyName. 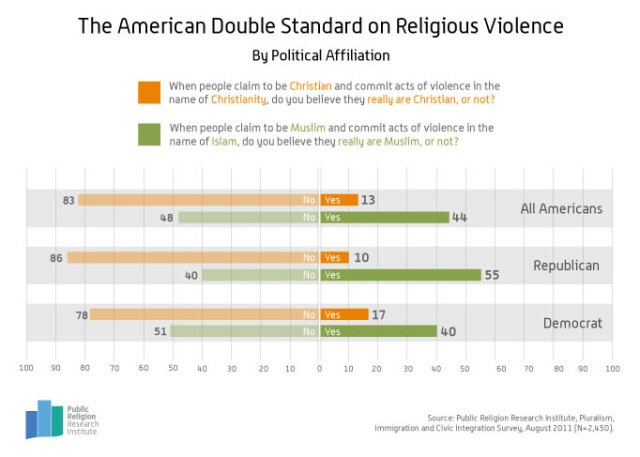 A PRRI survey found that Americans have a double standard when evaluating violence committed by self-identified Christians and Muslims. More than 8-in-10 (83 percent) Americans say that self-proclaimed Christians who commit acts of violence in the name of Christianity are not really Christians. In contrast, less than half (48 percent) of Americans say that self-proclaimed Muslims who commit acts of violence in the name of Islam are not really Muslims. Among white evangelical Protestants, the gap is a staggering 47 percentage points: only 10 percent of evangelicals believe that a self-identified Christian perpetrators are really Christian, compared to 57 percent who believe that self-identified Muslim perpetrators are truly Muslim.